Against this backdrop, in 1924, the pretty wife of a distinguished Boston surgeon came to embody the raging national debate over Spiritualism, a movement devoted to communication with the dead. Reporters dubbed her the blonde Witch of Lime Street, but she was known to her followers simply as Margery. Her most vocal advocate was none other than Sherlock Holmes’ creator Sir Arthur Conan Doyle, who believed so thoroughly in Margery’s powers that he urged her to enter a controversial contest, sponsored by Scientific American and offering a large cash prize to the first medium declared authentic by its impressive five-man investigative committee. Admired for both her exceptional charm and her dazzling effects, Margery was the best hope for the psychic practice to be empirically verified. Her supernatural gifts beguiled four of the judges. There was only one left to convince…the acclaimed escape artist, Harry Houdini. 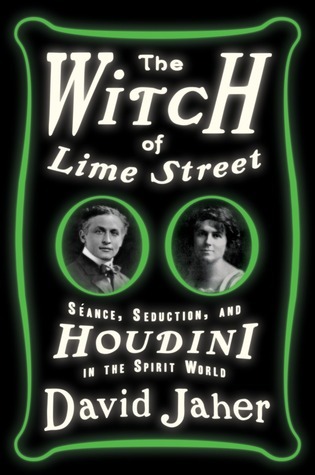 David Jaher’s extraordinary debut culminates in the showdown between Houdini, a relentless unmasker of charlatans, and Margery, the nation’s most credible spirit medium. The Witch of Lime Street, the first book to capture their electric public rivalry and the competition that brought them into each other’s orbit, returns us to an oft-mythologized era to deepen our understanding of its history, all while igniting our imagination and engaging with the timeless question: Is there life after death?